With 208 runners, the Y5 field was the largest of the day. 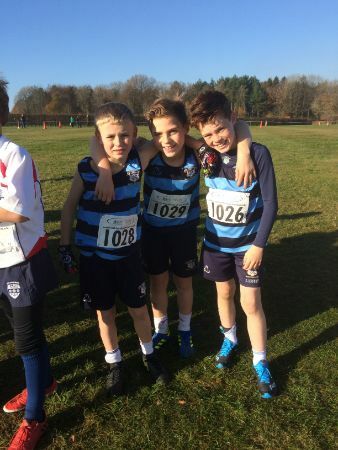 Max M, Jacob J and, in his first race in a Saint Ronan’s vest, Monty G kept their cool amongst the jostling elbows and steeled themselves for two laps of the course. The open plan of the circuit made for a fast race, but the hills took their toll on legs, many competitors slowing to a walk. Not our boys! All three of them showed grit and tenacity, Max leading his team home in seventeenth (10:32) place. Less than a minute behind him, Jacob crossed the line in 59th(11:22) and, summoning a final sprint which took him past several competitors, Monty finished in 128th(12:46)place.